Hartford Services has the tools and expertise needed to provide a fast, reliable, full-service installation. We work with these brands because of their outstanding performance and reliability. All of our AC systems, no matter what the brand, are covered under a Manufacturers' parts and Hartford Services labor warranty. If you prefer we install a different brand of AC system in your home, that�s okay! We will work with the trusted manufacturer of your choice. Our AC installations are quick and seamless, without sacrificing attention to detail. Our technicians are clean, fast, friendly and knowledgeable. They will answer any questions you have during and after the installation. It is our policy to ensure the best customer service each and every visit. From the beginning you will have several system replacement options. We will give you our honest opinion based on what we would do if it were our own home. We get it right the first time. When an AC system is not installed properly, it costs time and money to repair it. 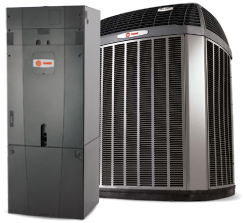 Hartford Services will not only install your system per manufacturers' requirements. Our maintenance plan includes two regular check-ups per year ensuring your new system runs at peak performance. For more information about our installation services or to request an appointment with of our technicians, contact us today.